So you’ve seen on your bag of coffee beans that it’s a Light or a Medium or Dark Roast. You might have even seen some other roasts like City Roast, or a City+, Verona, French or Cinnamon Roast. Well, the label a roast gets depends on how long the raw green coffee beans have been roasted for. This roasting process is a lot like cooking the beans and causes their eventual tastes in your cup to change considerably. Lighter roasts are known for keeping more of the natural flavor of the coffee beans, darker roasts are known for a smoky, charred taste that many people love. This process is even more fine-tuned with espresso roasts, where small differences are recorded with names like City Roast and French Roast. That’s just a very brief description, and I’ve not got into the reasons why you’d want to choose each roast and also you’ve just got to see the coffee wheel I’ve got just below. So keep reading! What Is The Difference Between The Roasts? Broadly speaking, the lighter roasts bring out the inherent flavor of the coffee bean and so are preferred for higher quality beans and upmarket roasters. Darker roasts dull the flavor of the coffee bean and give it a burnt, caramel-like taste (which, to be fair, many coffee drinkers enjoy). That said, each coffee is different and any coffee bean may be more suited to a particular roast. The main rule is: if you want to taste the blueberry notes in your Ethiopian Harrar or the orange zest in your Guatemalan Huehuetenango – you need a light or medium roast. If you’re really serious about bringing out the amazing flavors of high quality coffees then you need to be smart about buying coffees and (crucially) invest in a good hand or automatic grinder. And despite much debate one way or the other, caffeine doesn’t change appreciably throughout the roasting process. A light roast will have pretty much the same caffeine as a dark roast. More on that in a sec. Coffee beans roasted to a light roast are a pale brown color with little sheen from oil on the surface of the bean. The beans have been heated to a relatively low temperature and typically roasted to around the first crack. Light roasts are the highest in acidity – often described as brightness – and lowest in bitterness. Brighter coffees are full of fruity, zesty and floral flavors with tasting indicators like melon, blueberries, jasmine and lemon. They can also be quite an acquired taste, some people just don’t want their coffee tasting like grapefruit. Light roasts present some problems, too. They are less commonly used for espresso as it’s more difficult to dial in quality espresso shots – they have a tendency to produce an unpleasant sour taste. They are also notorious for being the most difficult roast to perfect for the roaster. Coffee beans roasted to a medium roast are brown in color and still with little oily sheen on the bean. Medium roasts are typically roasted to between the first and second crack. This roast is considered the ideal in terms of balance of flavor and aroma. If light roast has high acidity and low bitterness whereas dark roasts have low acidity but high bitterness, here’s the middle ground. In high quality coffee beans it is the most popular roast because of this reason. Although light roasts and dark roasts sound different and exotic, medium roasts are usually your best bet. They are the best of both worlds and that balance of flavors means you get the best possible taste in your cup. In general, anyway. Coffee beans roasted to a dark roast become a dark brown color and have a oily sheen. They are brought to very high temperatures and are typically roasted up to and sometimes beyond the second crack. Dark roasts are high in bitterness and low in acidity and at this point the high heat has destroyed much of the complexity of the coffee bean. When you roast your beans to a certain temperature they will taste (and basically be) charred. You’re tasting carbon rather than coffee. This produces a cup that tastes burnt, smoky, bitter and retains little of the natural flavor of the coffee bean. This is not necessarily bad. Many people love a burnt tasting coffee. That burnt, smoky, charred taste is what they associate with coffee and what they want to taste. It’s for this reason that much bad coffee is dark roast. You may notice that lots of instant coffee use dark roasts as a way to mask the deadness of the flavor and texture. Not that all instant coffee is awful, of course. A quick mention of espresso, the tallest of the poppies in the coffee world. As is so often, things work a little differently for this little beast. Espresso coffee generally suits darker roasts like a City, Full City, French or Vienna – closer to or past the second crack. You’ll hear those roast names much more when speaking in espresso making circles. The unique high-heat high-pressure extraction process of an espresso machine can bring out the harshness of tasting notes, turning your delicate, fruity single origin into a bitingly harsh, acidic disaster. Dialing in quality espresso is hard. Dialing it in when your beans are a touchy light roast is even harder. Nothing more frustrating than making sour shot after sour shot. The darker roasts where the sugars have had time to caramellize are far easier to produce quality espresso. The caramel softens the harsher notes in the coffee bean. Of course, this is a general rule and things change massively depending on the region the coffee beans is from, the skill of the barista and the grind quality. When you grow coffee you make the Coffea plant which produces coffee cherries like this. Inside these coffee cherries are housed one or two green coffee beans. These are extracted from the cherry using a number of processing techniques. 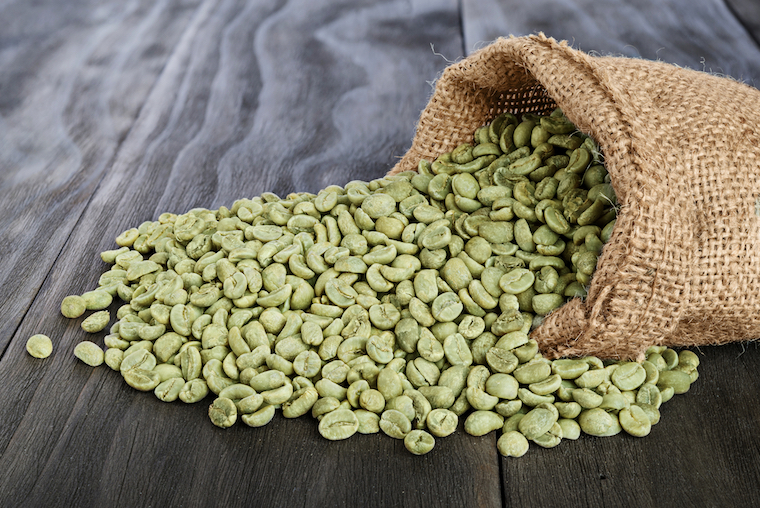 Green coffee beans have a grassy, piney smell. They are raw and completely unsuitable for making coffee. These softer green coffee beans need to be roasted at high heat before they are suitable for grinding and brewing. 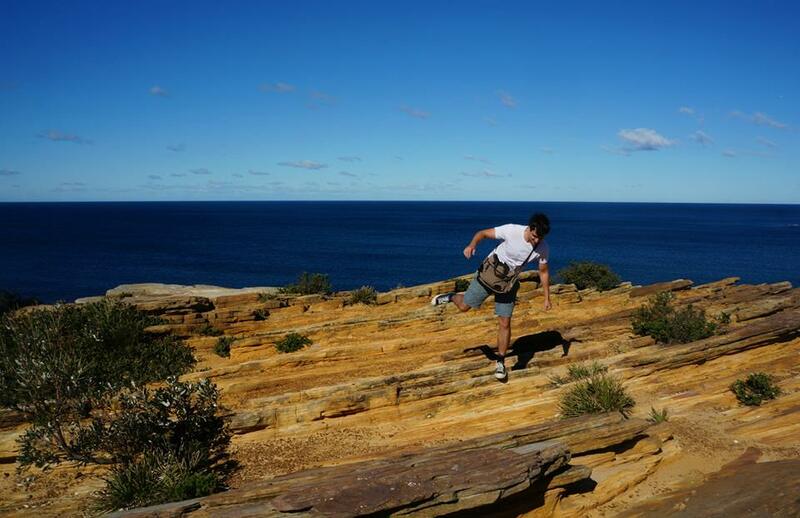 Think about that packed of salted peanuts you might eat while sinking a few cold ones. They’ve been been roasted, they have that “crunch” that comes from being cooked at high temperatures. You are never served raw peanuts. Coffee beans are pretty similar. Roasting your own coffee beans is more feasible than you might think. 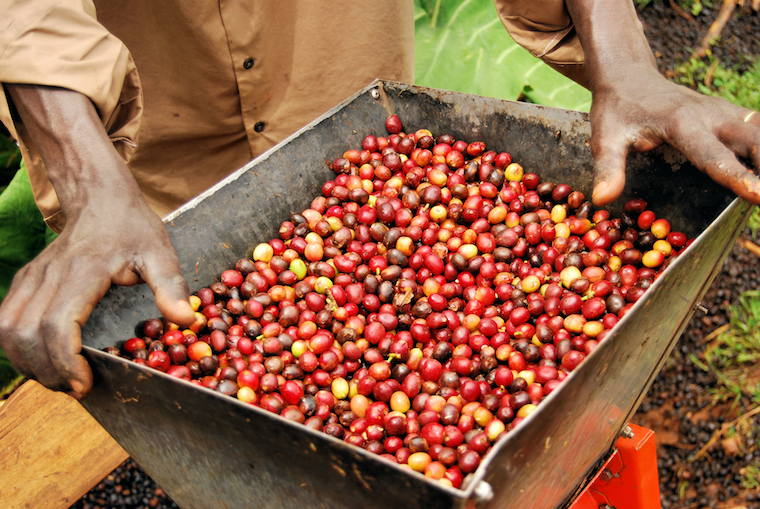 Go online and you can buy green coffee that comes straight from the farm. It’s simple and it’s cheap, a lot cheaper than buying roasted coffee. The beans last for a long time too, 6-12 months as a rough estimate. And you can do the roast in something as commonplace as a frying pan! Despite that, most people buy their coffee beans already roasted. 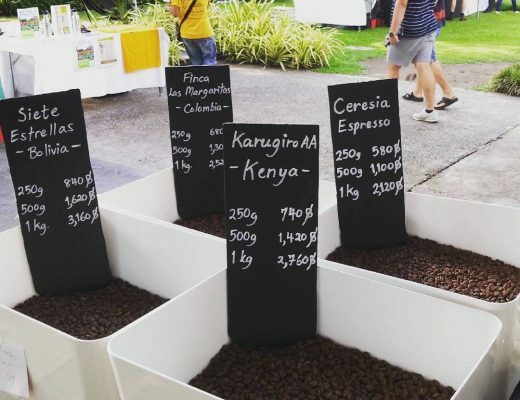 The gamut of coffee roasters runs all the way from major corporations that mass-produce their signature blend of coffee that tastes the same year on year to the plucky independent roasters that pushes the boundaries with dry processed single origins. 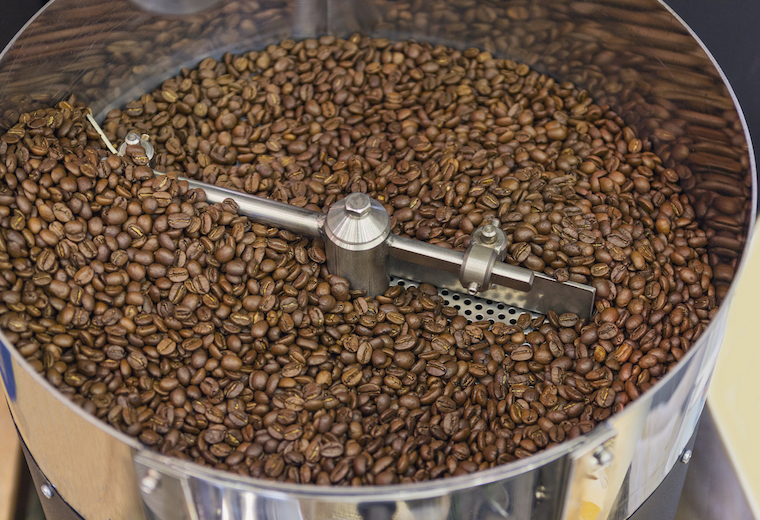 Roasting coffee is essentially heating up the green coffee beans until they turn brown. It’s a quick process, lasting from 10-20 minutes on average. You can cook them on your home kitchen stove in a pan or you can use super expensive commercial roasting equipment. To create really great roasted coffee you’re going to need to experiment with temperature, air flow, types of bean and a whole lot more. People dedicated their lives to this craft, it’s no easy process. Let’s take a look. Roasting coffee beans is the process of heating them up. The composition of the bean changes as their internal temperature increases and will turn from bright-green little things to silky dark-brown bundles of joy. You can see how the color slowly darkens over time as in this fantastic graphic. Outside of unroasted beans, there are three main groupings – light, medium and dark – beans go through in the roasting process. Each of these has a number of smaller groupings such as Cinnamon Roast, City Roast or French Roast. You can see this in the next wonderful graphic which also shows at what stage the coffee beans temperature will be (roughly). Many coffee shops will not be any more specific than light, medium or dark with their roast. Advertising their beans as Italian Roast, French Roast or Vienna Roast shows a little more understanding. These more specific names are more common in beans made for espresso as opposed to brewed coffee. The overload of names and jargon might be a little off-putting to the casual coffee consumer! The most technical and accurate descriptions of the roast are City, City+, Full-City and so on. This is usually the domain of coffee roasters or those who are very experienced with making coffee. What Are The First And Second Cracks? Coffee beans start off green and begin to slowly change color through the roasting process. The first thing that happens is the heat begins to dry out the coffee beans, turning them a shade of pale-yellow. This takes just a few minutes. The first crack is the sign that the roasting process is truly underway, this happens when the temperature of the beans reaches about 196°C (385°F). 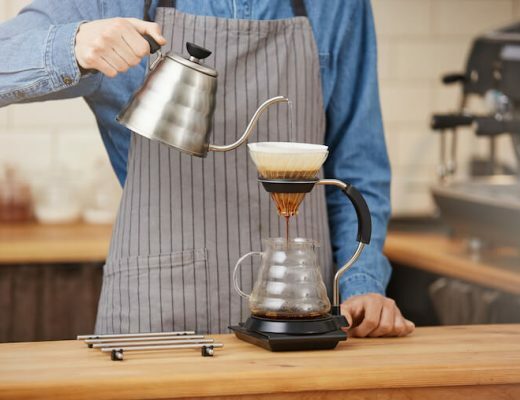 You will hear lots of individual crackling noises – this is your coffee beans popping as the water is evaporated into water vapor and the pressure forces the coffee bean to expand. The coffee beans will start to go light brown. This is often considered the first point at which the roast can be considered finished and you can make coffee out of your beans. Ending the roast here will result in a light roast. Between the first and second crack the sugars in the coffee bean begin to caramelize. This changes the taste from acidic and fruity to burnt and chocolatey very quickly. This process is what makes the color of the bean become browner and browner. Medium roasts, known for their balanced flavors, fall somewhere in this range. The second crack comes later in the roasting process, roughly when the temperature of the beans has reached 225°C (437°F). 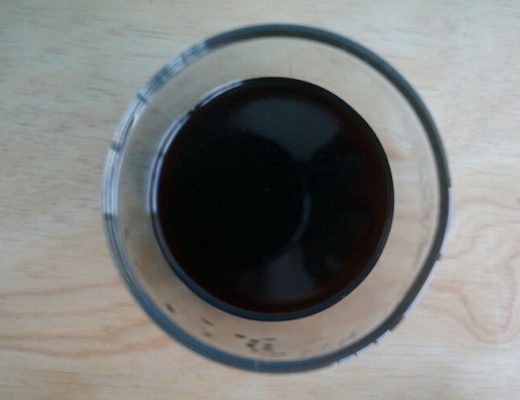 It’s a lighter pop than the first and comes from the oils in the coffee reaching the surface. The coffee beans are becoming a very dark brown now and have an oily sheen from those oils coming to the surface of the bean. At the second crack the coffee beans have been cooking for a long time so much of the sugars have caramelized, significantly affecting the taste. The longer you roast after second crack the more of a burnt and charred carbon taste you will get in your coffee. Shortly after second crack is considered the point where the beans become a dark roast. It’s worth mentioning that after the roast, it takes a little while for the coffee beans to hit their peak flavor. You’re going to want to leave it at least a day or two for the coffee to degas or the CO2 from the roasting will ruin your coffee. Also, for best results, brew and drink your coffee within a month. 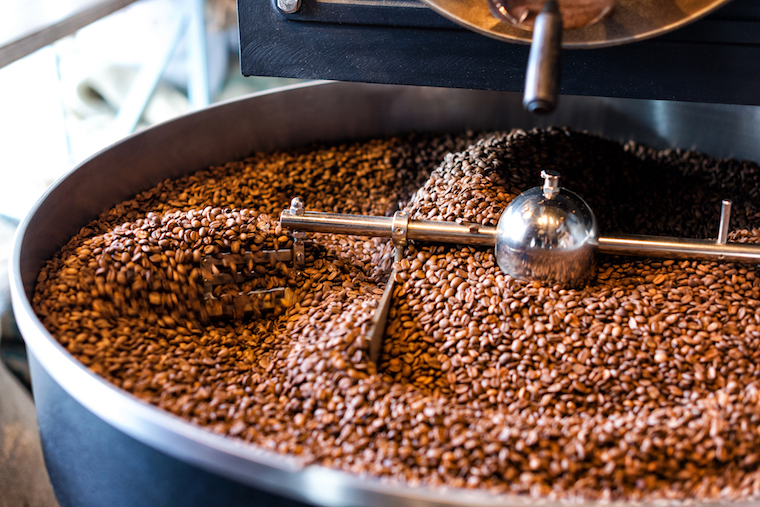 There’s a lot to learn on the topic of freshly roasted coffee. If you wanna see where all this magic happens, take a look at the next photo. It’s a roasting drum in full swing in the process of creating a new batch of roasted coffee beans. The device in the middle swirls round to keep the coffee beans moving. Does A Lighter Roast Have More Caffeine? It’s a common misconception, and one I believed for a long time, that lighter roasts were more caffeinated. The thinking goes that caffeine is ‘burnt away’ or somehow degraded when being cooked at very high termperatures, so the longer the roast (i.e. the longer the burning) then the less caffeine will be retained. It turns out the caffeine is remarkably stable throughout the coffee roasting process. This means that if you take one bean of light roast and one beans of dark roast that are otherwise identical, the difference in caffeine between the two is negligible. What’s more is that dark roasts do contain less water and so weigh less, which means that in any given bag of coffee (let’s say 1/2 lb = 227g) you will have more coffee beans in the dark roast. So going purely by weight, you will get a small amount more coffee with dark roast. Going purely by number of coffee beans, it will be the same. What Coffee Roast Should I Buy? New to coffee? —> go for medium roasts. High quality coffee beans? —> go for lighter roasts. Like the smoky, burnt taste of coffee? —> go for dark roasts. Making espresso? –> go for darker roasts. It has been shown the coffee has mild health benefits including a lowered risk of Type 2 Diabetes among other things. It is also noted for its antioxidant effects of which the lighter roasts have been shown to have more of. Which roast is more bitter? While unpleasant bitter flavors are going to mostly come from poor coffee beans, bad storage conditions or mediocre roasting, generally darker roasts will produce a heavier, smokier and more bitter taste. What is a blonde roast? It’s a term Starbuck’s made up to make their light roast sound nicer. I don’t really have one. I’ve tasted amazing and average brews from all different kinds of roasts. My strategy is to simply find good roasters and trust them implicitly to find the best roast for a particular coffee bean. It has worked pretty damn well so far. I’m sure this will change when I (finally) start learning about roasting my own coffee beans at home. – Above all else, experiment! African coffee beans are famous for the acidic and fruity notes but that doesnt mean you shouldn’t be trying a dark roasted Ethiopian. Different roasts have different flavor profiles and produce lots and lots and lots of combinations of great coffee. Again: experiment. – Don’t fret too much on the roast level if you’re a beginner. Far more important factors you should sort out first to make nice coffee are good quality coffee beans, grind evenness, freshness of the roast and an airtight brewing technique. – If you’re reading this I guess you like learning about the intricacies of great coffee. Well, there’s a lot to learn. You might also want to delve into single origin and blend coffee, how long coffee beans stay fresh after roasting, how the taste of coffee changes by region and a comparison of loads of the main methods of making it. – If you wanna get some high quality coffee delivered to your door it’s a lot easier than it used to be. – If all this really interests you, look into roasting your own coffee. You can start with just a frying pan and $5 for some green coffee! – I am quite fond of dark roast coffee for all its faults. Paired with a French Press, something about that smoky, burnt taste is just what I need on a tough Monday morning.